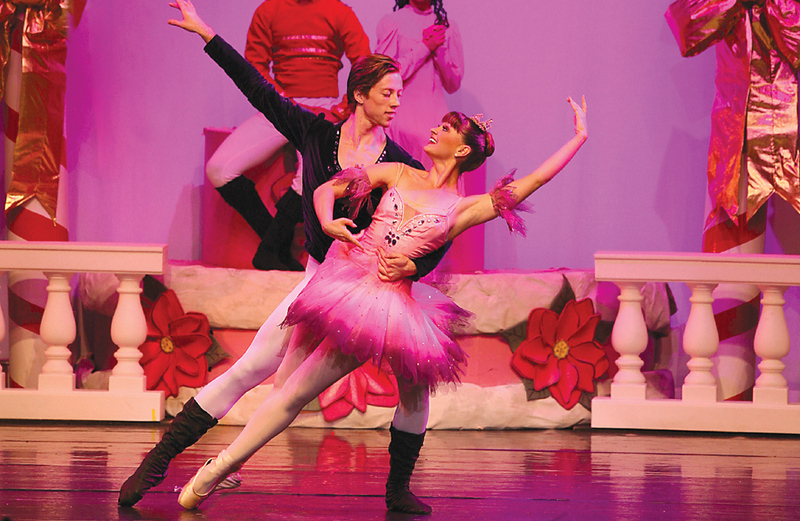 Tchaikovsky’s “The Nutcracker” is a holiday tradition in Laughlin many look forward to each and every year. This holiday tradition allows people to experience live art, with the classic tale told through dance. It makes appearances in theaters across the country, often in venues not given to ballet. Such is the case when the Anaheim Ballet brings its production of “The Nutcracker” to the stage of Don’s Celebrity Theatre within the Riverside Resort, Thursday-Sunday, Dec 6-9. The ballet’s first pirouette in Laughlin was more than 30 years ago and has since become part of the December holiday experience. A family tradition as well for many residents who have the chance to see a top-notch ballet company perform one of the holiday classics without traveling to a big city — or if you have traveled here from a big city, it is your chance to see a top tier performance at a bargain price without worrying about parking. The show this year not only is in keeping with tradition, but there are a couple of new twists. “Each year Anaheim Ballet brings a fresh twist to the classic tale of “The Nutcracker,” said Larry Rosenberg, the ballet company’s producer/director. “The heart of the story — good overcoming evil — remains unchanged, but other aspects of the ballet are developed each year. Anaheim Ballet Artistic Director Sarma Lapenieks Rosenberg, who had studied the musical score was always puzzled by companies’ representation of a love duo or prince and princess, Rosenberg said. Another unique element of the show — one of the performers is a “veteran” dancer who also happens to be a U.S. Marine. “Sgt. Jorge R. Lagunas is a digital wideband repairman, stationed at the Marine Corps Air Station Miramar with Marine Air Control Group 48 in southern California, but Laughlin audiences know him simply as Richard Lagunas,” Rosenberg said. “He began training with the Anaheim Ballet in our outreach program at 8 years old. He’s performed in Laughlin with Anaheim Ballet’s “Nutcracker” for close to 16 years in numerous roles. He is with the Marine Wing Communications Squadron 48 Detachment, and will be dancing the parts of the Snow King and the Chinese ambassador. “We thank Richard for his service to our country and for his dedication to the ballet,” Rosenberg said. The entire troupe of dancers are dedicated to making the show special every year. “The dancers see the show with fresh eyes and enjoy preparing for it,” Rosenberg explained. “Coming to Laughlin is like coming to a home theater because we know we’re going to get a great deal of new visitors, as well as people who have never missed a production. Many people don’t realize they are more familiar with Tchaikovsky’s music than they thought. Sometimes it is the background music in commercials for things like M&Ms or Target stores, but the ballet became a popular holiday tradition around the same time the Disney film Fantasia came out in the ’40s. Part of the excitement is that each production by the Anaheim Ballet has its own characteristics. There are often new dancers, new costumes and slightly new interpretations of the classic story. “We add elements that other companies just gloss over,” Rosenberg said. “For example, in the ‘Grandfather Dance’ in Act I, all of the party guests are characters playing a specific role. Every character is carefully thought out so it’s not just a generic ballet setting. Audiences can watch the reactions of the various characters, their interaction and identify with them. Experience a spectacle of towering Christmas trees, waltzing flowers, battling toy soldiers and menacing mice. A few years ago, previously unknown music composed by Tchaikovsky for “The Nutcracker” was discovered by arranger/composer John Lanchberry. That “new” music is featured in the Anaheim Ballet’s production at the Riverside Resort. The 50-member cast includes all ages, from very young dancers in the roles of party guests, bon-bons tossing out candy to the audience, toy soldiers and mice, to veteran dancers, athletic Russians, graceful Snow Queens and Sugar Plums playing dual roles. “The most motivating factor is the passion of the players,” Rosenberg said. “We take great care in doing this one differently by creating characters because we want this production to be unique and inspiring. Of course, we respect the integrity of the original ballet, but it’s not just ballet — it’s a full theatrical performance full of structured ballet. And when people return each year to see our productions, you know you’ve connected with them. There is always something to see.